← Original Award Reduced From $12.6 Million To $9.7 Million For Slip And Fall Injury Victim. If you or a loved one has been injured in a Massachusetts personal injury accident, the best way to protect your rights and achieve fair and just money compensation for your personal injuries and expenses is to contact one of our expert personal injury attorneys. The skilled attorney advocates at the Law Offices of Gilbert R. Hoy, Jr. and Affiliates are dedicated to helping Massachusetts personal injury victims get the compensation they deserve. Please call our full service Boston law office today and take the first step towards protecting your rights. We know how important your personal injury claim is for you. You can call us 24 hours a day, 7 days a week at 617-787-3700. If it is more convenient for you, Attorney Hoy will come to your home, the hospital or another convenient location to discuss your personal injury claim. Our dedicated attorney advocates are committed to putting the needs of our clients first. This means providing skilled legal representation, while maintaining top-notch client service. Our lawyer professionals pride themselves in treating each client with the respect and individualized attention they deserve. Our personal injury attorney specialists understand the physical, emotional and financial burdens imposed on injury victims in light of their injuries and accompanying expenses. When the breadwinner in a family is injured, it can have a severe and unexpected impact on the entire family. Medical bills can pile up, and an inability to return to work can make injury victims feel helpless and overwhelmed. There is help available! At the Law Offices of Gilbert R. Hoy, Jr. and Affiliates, we will fight diligently and tirelessly to get you the money compensation you deserve. The Law Offices of Gilbert R. Hoy, Jr. and Affiliates is a team of highly talented Boston attorneys hand-picked by Attorney Gil Hoy because of their skill, experience and expertise. Attorney Hoy graduated from the University of Virginia School of Law in 1984. He immediately went to work at some of the nation’s top law firms in Chicago, New York City and eventually right here in Boston. In 1995, Attorney Hoy decided he wanted to represent individuals, not just big businesses. 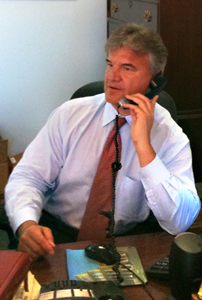 He opened the Law Offices of Gilbert R. Hoy, Jr. and Affiliates to represent injured Massachusetts individuals. Since then, Attorney Hoy and his talented team of lawyers have assisted thousands of Massachusetts residents and recovered millions of dollars in damages for our clients. Our law office’s attorneys are brought to our clients through referral agreements. This means our client’s receive the expertise of Attorney Hoy and other attorneys who specialize in the type of personal injury the client has suffered. Many of our skilled attorneys have been recognized as among the very best lawyers in Massachusetts and around the country. Our Boston attorneys have been chosen as Massachusetts Super Lawyers and New England Super Lawyers by Boston Magazine, as Boston’s Best Lawyers and Lawyer of the Year by the Boston Globe, and for inclusion in the Best Lawyers in America. Please call our Boston law firm today to schedule a confidential and free meeting to discuss your personal needs at 617-787-3700 or by email at info@gilhoylaw.com. Our experts will work diligently and tirelessly to fight for you and get you the best results possible. Your needs are our top priority! This entry was posted in Boston Car Accident Lawyer, Boston Negligence Lawyer, Boston Personal Injury Lawyer, Boston Wrongful Death Lawyer. Bookmark the permalink.